Who can resist a buttery dinner roll still warm from the oven? Parker House Rolls, those soft little pillows of freshly baked bread, are most easily recognized by their shape. Rounded and folded over onto themselves, they’ll puff up in the oven and become crispy golden brown on the outside, deliciously soft on the inside. In our home, there are never any complaints at dinner time when fresh rolls or bread of any kind accompany dinner. Dinner rolls seem to make an everyday meal a bit more special. The bread is passed back and forth, sometimes tossed through the air or even stolen from a sister’s plate. Soft butter and jam will always find their way to the table and the dinner conversation seems to linger a bit longer. When I was growing up, my mother would always swaddle the bread in a small piece of linen and then carefully place it in a serving bowl. I suppose I do this now for the same reasons she did, to keep the bread warm, and simply because this is how I saw my mother do it, and how she saw her mother do it… it’s tradition. 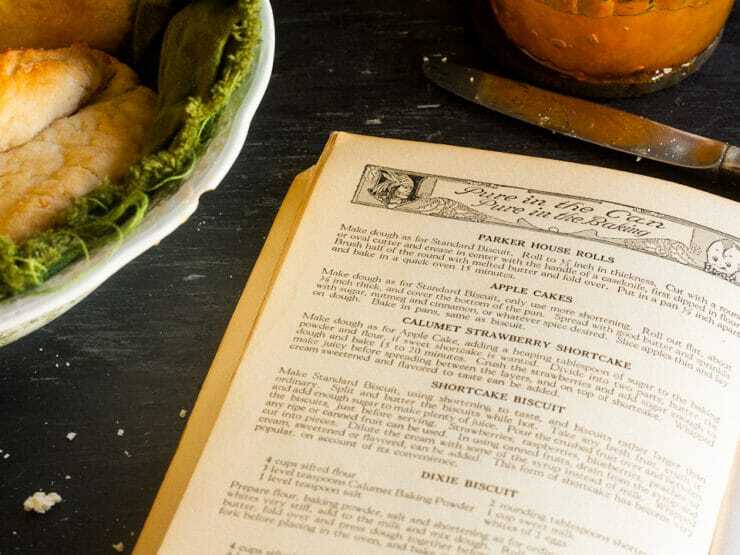 I love thumbing through vintage cookbooks and taking a step back in time to rediscover traditions, family recipes, and cooking products that are rich in American history. I was instantly smitten with this Reliable Recipes cookbook by the Calumet Baking Powder Company. 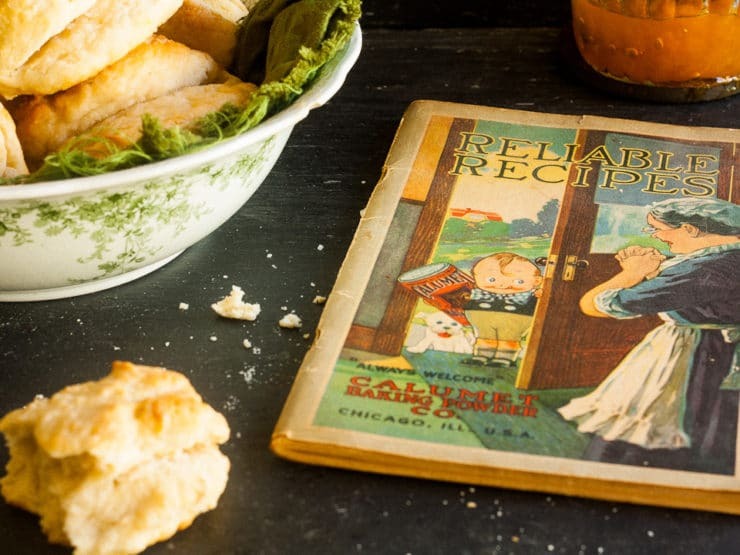 It was written in 1918 and I absolutely love that Calumet Baking Powder still exists today! Not only that, but just recently (while hunting for vintage treasures at a local flea market), I found a very old Calumet baking pan that I couldn’t resist adding to my collection. Calumet Baking Powder was established in 1889 by William Monroe Wright of Chicago, Illinois. 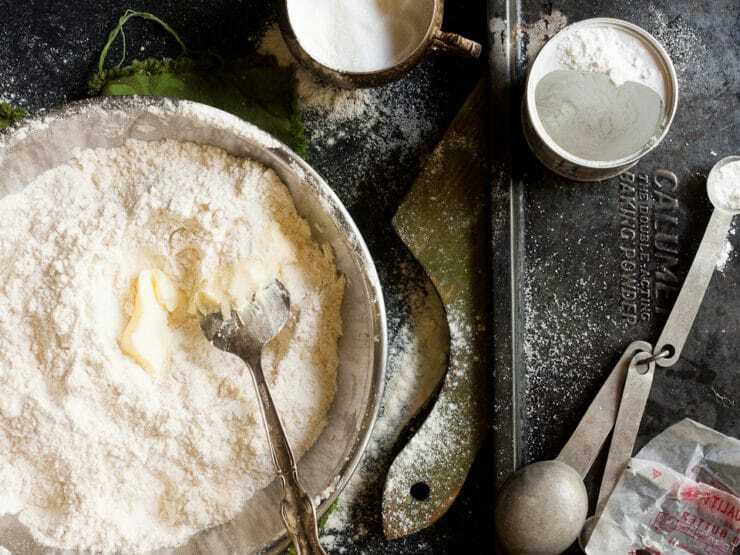 The cookbook’s pages are filled with recipes for everything from bread and biscuits to waffles, muffins, and gingerbread. But what is most noticeable about the book is the information on baking powder itself. 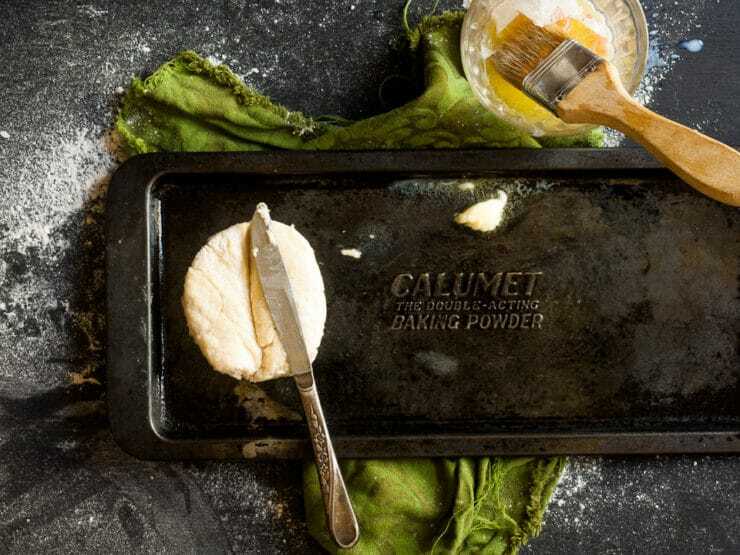 There are numerous pages dedicated to the science and health of using Calumet’s Baking Powder over their competitors because of Calumet’s dedication to a purer baking powder that is free from contaminants. 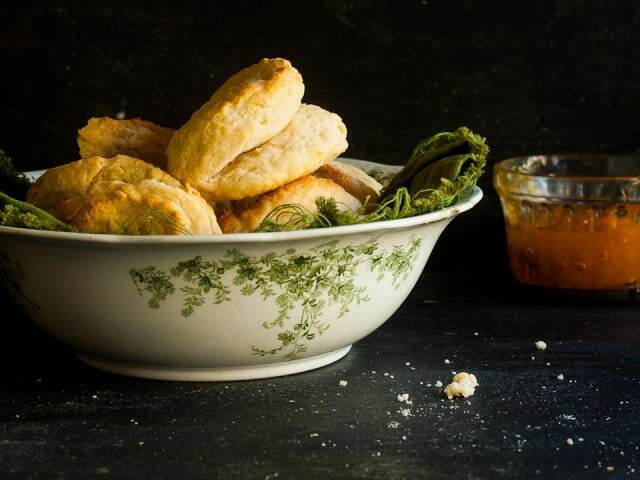 I chose the recipe for Parker House Rolls that are made from the Calumet “standard biscuit recipe.” The original recipe for Parker House Rolls can be traced back to the 1800’s and to the Parker House Hotel in Boston, Massachusetts, where you can still find them being served today. Variations of the story attribute their unique shape to an angry chef who tossed the rolls into the oven, resulting in their dented appearance! 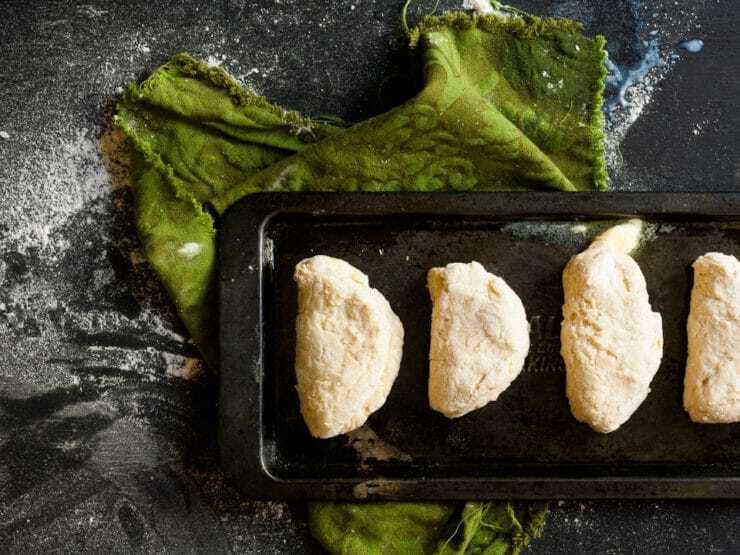 The Calumet recipe mimics the shape of the original roll but differs from it, in that the Calumet recipe uses baking powder as the rising agent in comparison the original Parker House rolls, which are made from a yeast-based dough. The Calumet Parker House roll recipe baked nicely and the folded biscuits took their traditional Parker House Shape. The recipe called for less butter than a typical biscuit, but surprisingly, the flavor wasn’t sacrificed. The heaping amount of baking powder allowed for a soft and tender crumb and a crispy outer crust. If you are looking for a traditional Parker House Roll, I would suggest trying the original recipe that is available from the Parker House Hotel. If you’re looking for an easy and tasty dinner roll from a 1918 vintage cookbook, this version is for you! 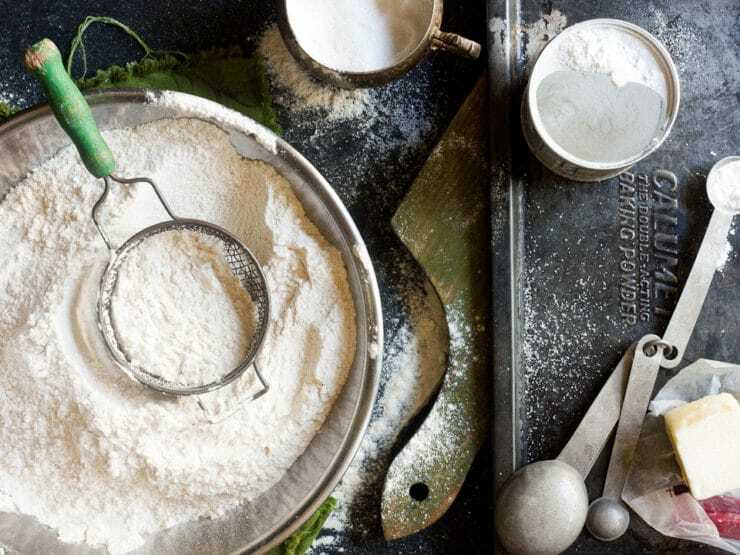 Sift the flour, salt and baking powder together into a large mixing bowl. 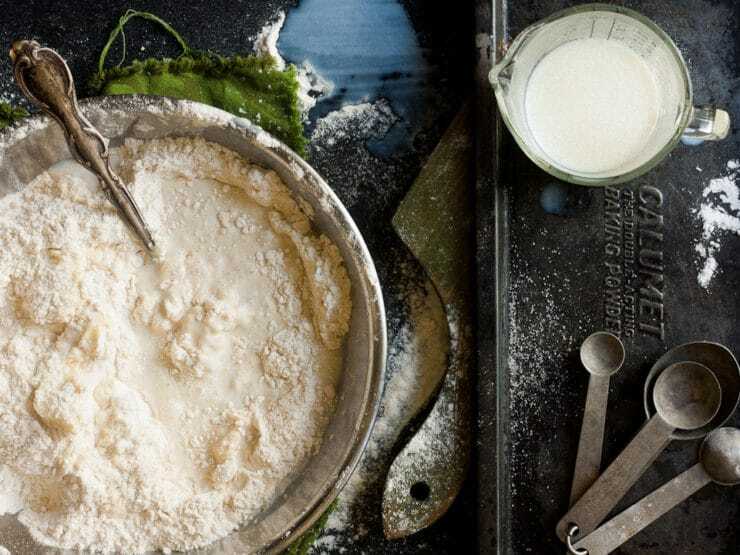 Rub shortening into the flour with fingers, a spatula, or the rounding edge of a large spoon. With a little practice, the spatula or spoon can be made to do better work than the fingers. Add milk or water, as cold as possible, mixing to form a very soft dough. 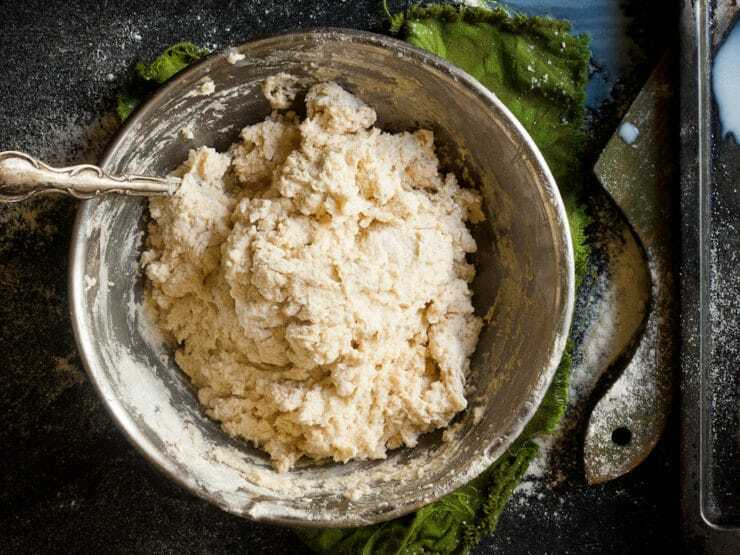 Mix with a spoon or flexible knife, in preference to using a warm hand, to keep the dough as cold as possible. 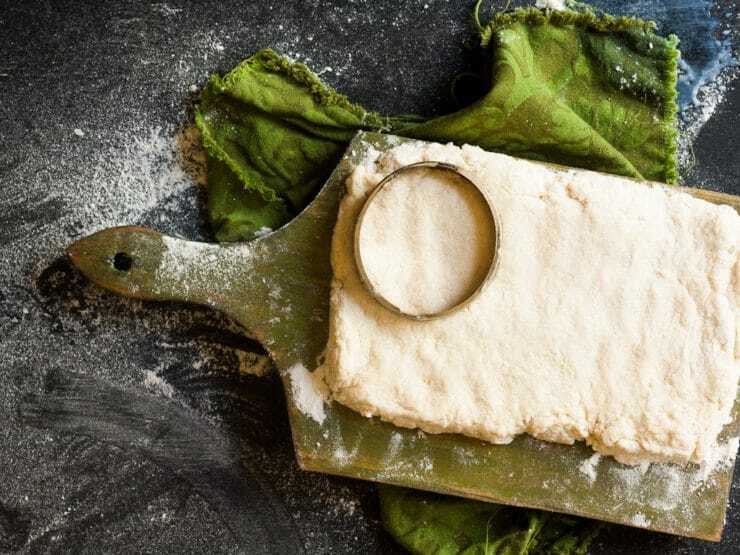 Turn dough on a well floured board and roll out lightly to 1/3 inch thickness. Cut with a round or oval cutter. Crease in center with the handle of a table knife first dipped in flour. Brush half of the round with melted butter and fold over. Put in a baking pan spaced 1/2 inch apart and bake at 450 degrees for 15 minutes. Serve warm with butter or jam. Kosher and Vegetarian Note: to make these biscuits kosher and/or vegetarian, use butter, not lard. These look amazing! Thank you for sharing!!? Easy enough decision to mmake these- now the hard part- which of your other delicious recipes to make them with! 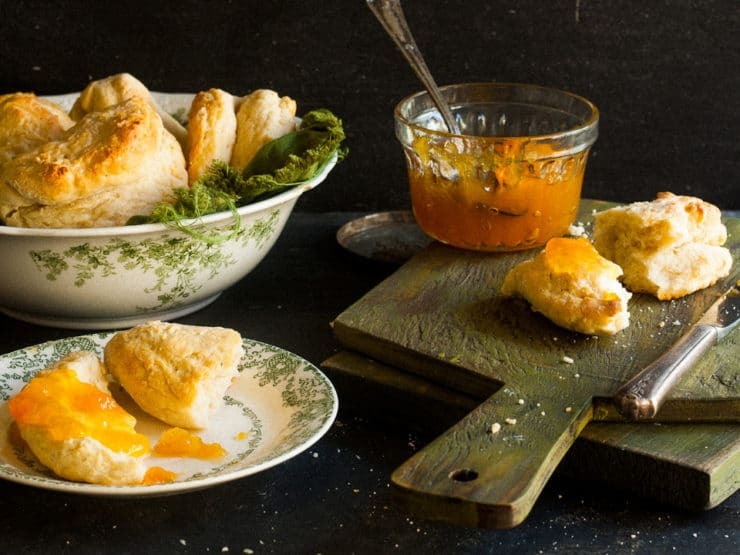 I make these biscuits a lot and they are so good. A little hard on the outside and soft on the inside. Delicious! I make the full recipe for 3 people and there are plenty of biscuits left over so we eat them over the next couple of days. Thanks for sharing this recipe! Carolyn, I bought this book at a vintage cookbook store and shared it with Louise. You might have luck searching the title on eBay or Etsy. Enjoy the rolls! http://www.vintagecookbook.com – at most, you may have some luck finding what you’re looing for on this web site – at the very least you will see some of the most fascinating old cookbooks from the last two and a half centuries. How neat! If you find out anything please post a comment here, we’d love to hear about it. Can these rolls be baked in cast iron bake ware and still come out as well? Let me guess your mom wrapped the biscuits in a linen? dream girl.. I wish you were single. Fresh baked rolls: the sweetest weakness! So happy Louise’s piece brought back good memories for you, Nancy. You have just made my day, and subsequently the day of both my husband and son when I make these beauties. Thank you!! Boys love bread ~ all three of mine sure do. I have a cookbook similar to that …wow! What is yours? This one is so very delicate, that I was afraid to open it up. of course the directions say to make the crease with the handle of a table knife but you did photograph that step showing the blade resting in the crease. Doesn’t mean that they won’t be great, anyway. My mom, also served hot rolls or bread nestled in a towel lined bowl. Good catch… the knife was so dull it worked.